This map shows the locations of the monitoring tubes which were up for 4 weeks this Spring, and the average reading of NO2 levels over that time. The WHO gives 20ug per cubic meter as harmful to health, and 40 is illegal according to the EU. As you can see, 15 of our 20 tubes were over 40, some considerably above. 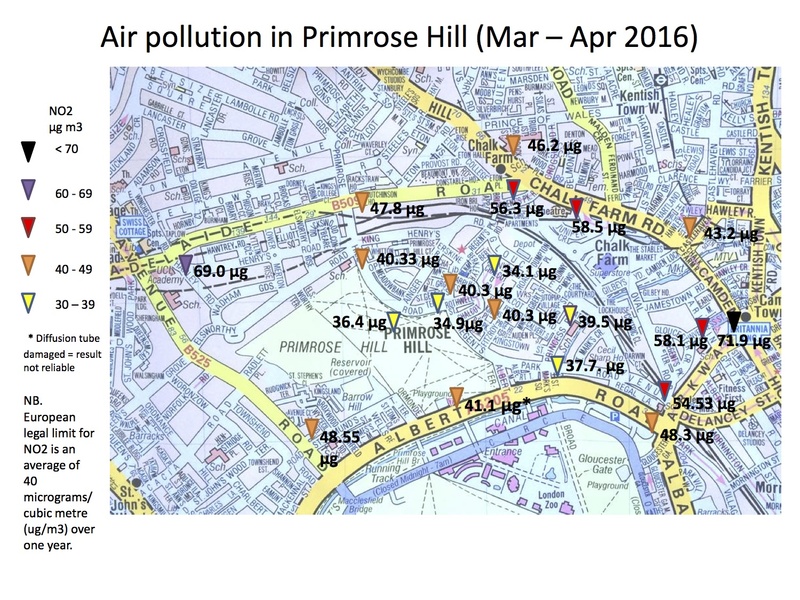 Six of the tubes were outside schools, and of these only Primrose Hill School, on a residential street, was just under 40, outside The Swiss Cottage Academy was a shocking 69ug per m3. What can you do? Well driving is not a solution: people in cars breathe in double the pollutants of those on the street. Schools can encourage walking by promoting clean air routes. Playstreets where traffic is closed off completely are a great idea for kids, even once a month. Even walking as far as you can form the curb helps a bit. And let your local councillor, London Assembly member, MP and MEP know that you want action fast. The main source of pollution is diesel engines. Scrappage schemes, rapid electrification of taxis, buses and council vehicles of all kinds, and a halt to tax breaks for diesel is just a start.